Coca Cola and Regal Cinemas have teamed up to to offer fans an early chance to win tickets to the movie premiere for Divergent sequel, INSURGENT. Want to rub shoulders with the stars and walk the red carpet like a celeb? Check the ways you can enter below. Promotion Period: The Sweepstakes begins at 12:00 a.m. Eastern Time ("ET"), January 24, 2014 and ends at 11:59 p.m. ET, March 31, 2014. There are 4 ways to Enter: US Only. Must be 18+. Read the full list of Rules HERE. 1. Purchase a large Coke and swipe you Regal Crown Club card. One purchase equals one entry. Maximum of 10 entries per card per day. 2. Mail - In Method of Entry: To enter without making a purchase, hand print your full name, street address, (no P.O. 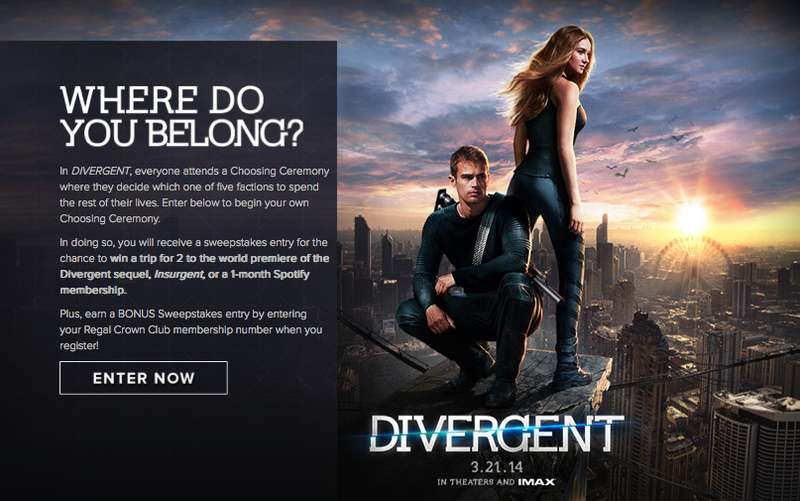 Boxes), day/evening/cellular phone number, RCC membership card number, email address (if any), and date of birth on a 3 1/2" x 5" piece of paper and mail it in an envelope with proper postage to "Divergent Sweepstakes - Regal – Sweeps Entry," P.O. Box 5056, Department 806695, Kalamazoo MI 49003 - 5056. You may submit up to one (1) total entry by mail per day and will receive ten (10) entries into the Sweepstakes per entry. Limit: One (1) entry per stamped envelope. All mail-in entries must be postmarked by April 1, 2014 and received by April 8, 2014. 3. Facebook Method of Entry: Visit the Regal Cinemas Page on Facebook at www.facebook.com/RegalEntertainmentGroup and click on the Divergent Sweepstakes application. If you don’t already "like" the Regal Cinemas Page, you must first click on the " like" button in order to access the application. Follow the links and instructions to complete and submit the registration form, including your name and valid email address. You automatically will receive one ( 1 ) entry into the Sweepstakes . 4. Website Method of Entry: Visit www.cokedivergentregal.com either directly or by scanning a Quick Response ("QR ") code located on specially branded Coca - Cola elements at participating theaters , and follow the links and instructions to complete and submit the registration, including providing a valid email address. You automatically will receive one (1) entry into the Sweepstakes. If you visit the website using a QR code, you will be charged according to your carrier's data rate plans. Insurgent is expected to open in theaters March 20th 2015.